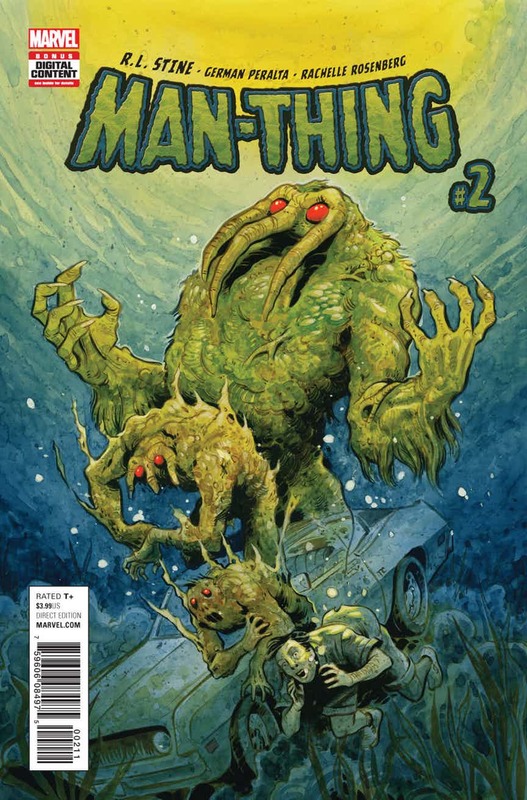 Man-Thing #2 follows on in much the same spirit as the first, as Goosebumps author R.L. Stine fills it with black humour and lots of pulpy horror. 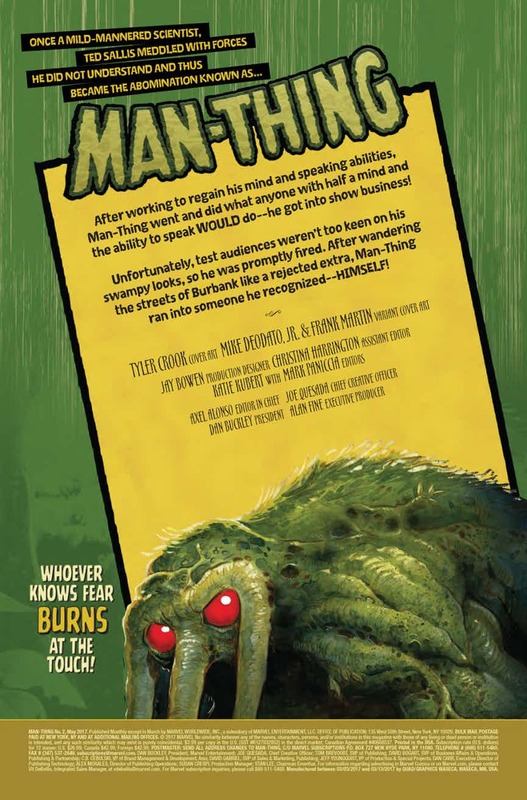 Man-Thing #1, the comic book debut of Goosebumps author R.L. Stine, proved to be a one of a kind book for Marvel. Much less interested in fitting in with the house style, it was largely a homage to the horror comics of decades gone by. This second issue follows on in much the same spirit, with all Stine’s usual black humour and love of pulpy horror. Somehow, though, it ends up being even weirder than the opening issue. After coming face to face with himself on the streets of Burbank, Man-Thing is teleported away back to his swamp in the Everglades. But with vulture, bat and snake attacks coming from all around, and a reunion with his lost love Lily-Ann Millard, something is very amiss. Could it be that the whole of reality is threatened and that Man-Thing is the only one who can cross the door to the Nexus of All Realities? Uh, yes, apparently. 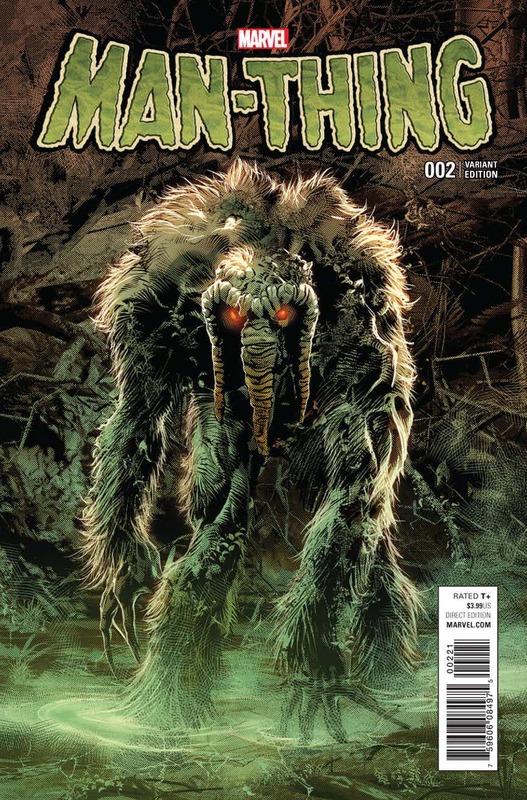 After an opening issue that seemed to be throwing out the traditional version of the character – Stine’s Man-Thing can not only talk, he constantly cracks jokes – this issue makes a welcome return to the classic Man-Thing world. In particular, longtime fans will be pleased to see things getting back to the mind-bending days of Steve Gerber’s classic run on the character. 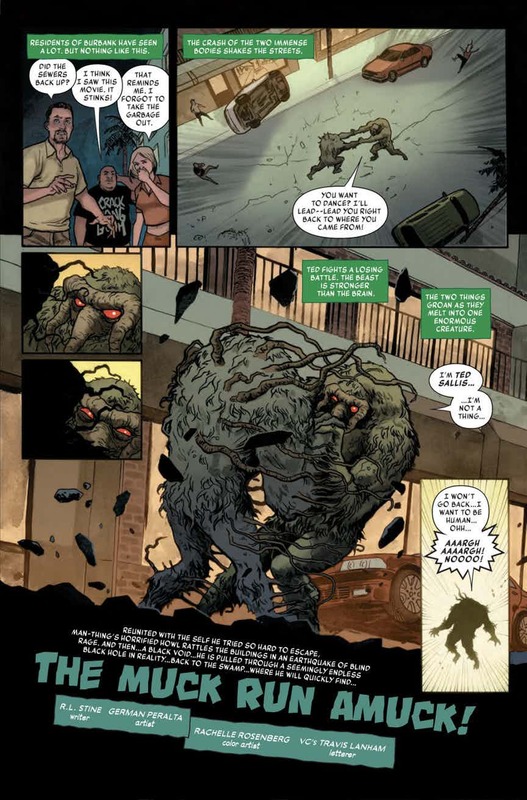 Man-Thing is one of Marvel’s weirdest properties – it introduced Howard the Duck, for crying out loud – so it’s nice to see Stine is wholly embracing that. Once again, though, the writer’s over-reliance on though bubbles and captions is obviously a deliberate homage to comics of the past, but it might turn off readers who are used to the more subtle approach of modern comics. Particularly as it occasionally crosses over into needless explanation. For instance, the issue opens with not one but two recaps of issue #1 – once in the preview before the comic starts proper and then in the captions in the comic itself. What’s fast becoming the highlight of this book are the ‘R.L. Stine’s Chamber of Chills’ B-stories – classic EC Comics (or Goosebumps) horror tales that end with a lurid twist. This week’s is ‘Drive the Horror Highway,’ as a man peruses down a haunted road at night. At just four pages, it packs in some great images and a completely unexpected final reveal – even if it is very reminiscent of a recent episode of TV’s Black Mirror. German Peralta is likewise on fine form on art duties. 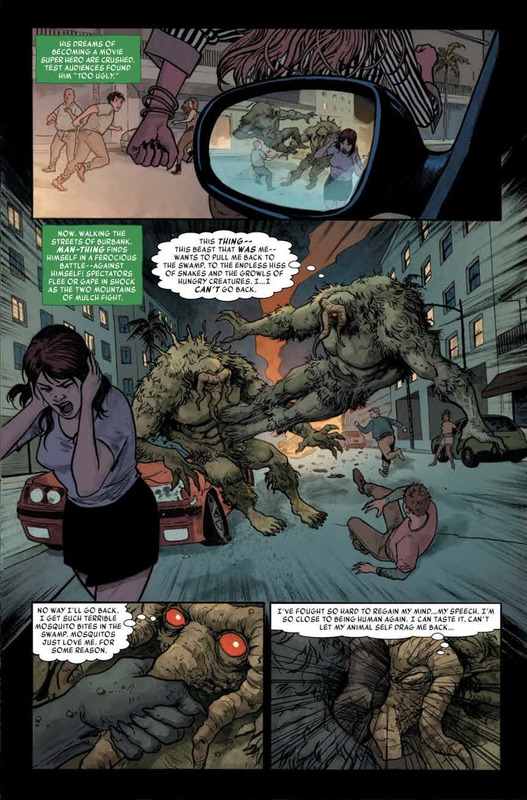 It’s not an action-heavy book, but the artist makes the most of the various mini-battles Man-Thing encounters this issue, such as his attack by a flock of bats and his confrontation with a giant alligator. On the smaller scale, Peralta does an exemplary job of showing Man-Thing’s emotions through his bright red eyes alone. Such as when he encounters Lily-Ann and his eyes grow wide and shiny. It is a tad cartoonish, perhaps, but it suits the OTT stylings of the book. Rachelle Rosenberg deserves a mention for her great color work, too. 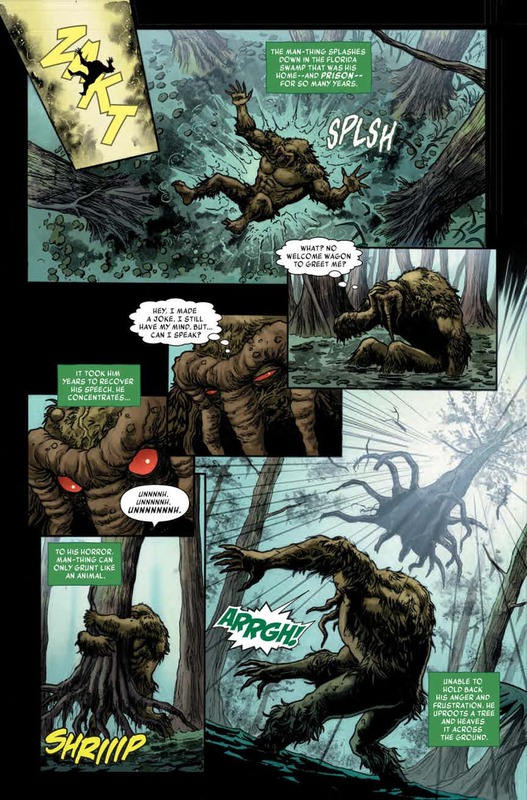 Man-Thing’s swamp is characterized with dank, wash-out tones which allows the central character to visually pop out of every panel. All in all, Man-Thing #2 continues to be a treat for comic book fans who are looking for an antidote to the usual superhero fare and are not afraid for things to get (very, very) weird.